The TradeLocks 2 Level Mortice Locks Tryout Keys (set of 7) is a great addition to any professional locksmith toolbox. With guaranteed durability and effectiveness this set can easily open most common 2 Lever Mortice locks such as the Union, Legge and Yale. Made to withstand everyday use and pressure the locks are tempered for strength and hardened. Developed thin enough to fit and energy all bullet warded locks. Every professional should be prepared with the right lock tools when heading out to a job. 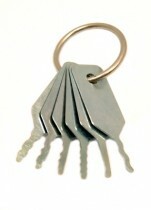 Most clients don't know they type of lock they have or what the problem may be it it needs repairing. Which is exactly the reason why you should always have the necessary domestic locksmith tools right with you at all times. We guarantee that the 2 Level Mortice Locks Tryout Keys in a set of 7 will come in handy regularly as these are some of the most common locks throughout the UK. You know that you are getting only the highest quality tools available on the market as we work closely with some of the most popular brands on the locksmith industry. The keys do not take up too much space and in combination with the 3 Lever Mortice Lock Tryout Keys you will be ready to take on any domestic job you are called to. 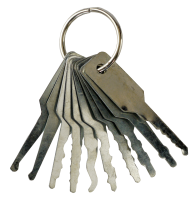 Lock tools are the extension of the hands of the professional locksmith. If a locksmith hasn't invested in the right lock tools that are not only suitable for the types of jobs they are called to but of high quality it will reflect directly on how they do their job and the kind of profit they make from their trade. By continuously updating your domestic locksmith tools you will always be ready for whatever job you are called to. With a price like this it's hard not to pass up an opportunity to add another very useful and effective lock tool to your toolbox. With shipping throughout the world, TradeLocks strives to give every locksmith ready to invest in their trade the upper hand on the competition and make a stable profit from their knowledge and experience. Please Note: This tool is very delicate due to the nature of their manufacturer and as such are non-returnable or refundable if broken.